Feathers and bones are picked up every 5 kills (unless "Kill Chickens" is turned off), and bones are buried when the inventory is full. Should be on the SDN soon. can i suggest adding the option to keep track of exp gained? 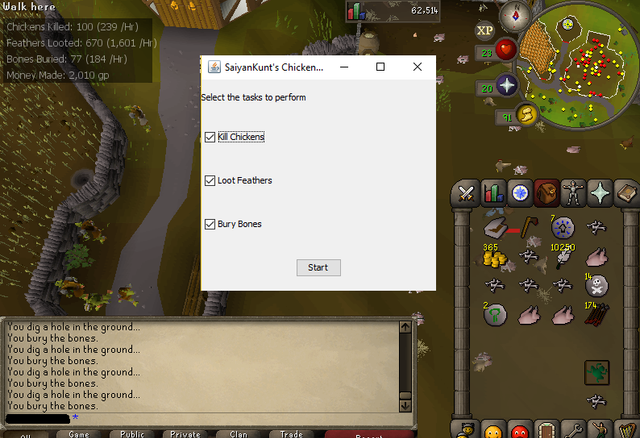 also noticed that if 2 chickens are on the same spot and one player is already fighting the "front" one the script will keep trying to fight the chicken in front as well instead of picking a different chicken/right click and choose the one that isn't under attack. When I get a chance I'll add the xp feature as well as the random intervals for picking up loot - good idea. Never knew about that last issue, I'll also take a look at that when I get the chance. I posted this by mistake when trying to edit my last comment. delete this please. Good suggestions. I did notice a couple of times the script takes a while to respond if it misclicked when trying to open a gate or pick something up, but it eventually responds. So you were around chickens and it stopped working completely without fixing itself after 20 seconds or so? i know that at least one time it stopped for as long as it takes to disconnect for being afk (then i manually reset the script when i heard the login screen music). It does not bury any bones for me. It should bury bones when the inventory is full. Is this not happening? Seems to be a good bot. I used it for my Obby Mauler to make some starting cash and have something easy to kill. No problems so far and have ran it for over 1h sometimes and no bans. For some reason, it isn't attacking the chickens. Am I missing something? Good script but it does not pickup the feathers/bones right after. Waits until the 5th kill then walks around and loots. Should loot right after kill. Also, implement some anti-ban to it like move the screen or look at stats. Where can I find the script? And how can I add it? how do i get premium member for no limit runtime ?